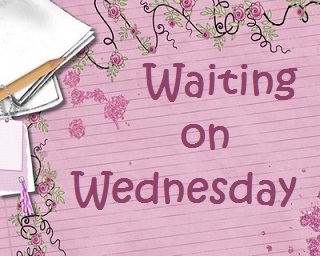 Waiting on Shine by Jeri Smith-Ready - My Life Is A Fairytale That Will Never End. Uh huh!! I've read about this serie on Jamie's blog and I decided to give it a try. And Oh my Gosh!!! This serie is AMAZING! I've finished the first book Shade 3 hours ago. 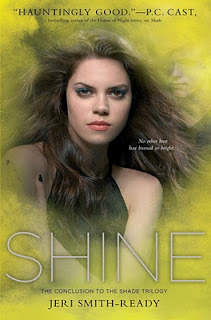 I started reading Shift almost imediately! Is just so good! Aura is a really cool character. She is the First of the new generation of Post-Shifters - and that means she can hear and see ghost. In the beginning they are pretty annoying. And then her boyfried dies. GOD!! He doesn't move on, but stays in this world. Aura is having troubles forgeting him, because he is always around. His family have the same problems, because they can't move on. And then there is this guy Zachary which is OMG!! Totally hot and great and caring and ohh I would like a guy like that! So you can imagine how many issues Aura actually has between her death-ghost-sort-of-boyfriend and Zach. It's great how the character develop through the book. I'm currently on quarter of the second book Shift, but if the ending will be similar to the ending of the first one.. God I will die. Ugh, I can't read the spoiler. I'm slacking. I haven't read Shade yet. I know, I know, totally terrible of me. And I don't know why the delay when I adore this series. It comforted me through my appendicitis, believe it or not. Oh no I haven't even started this series yet!! i have to get going! Oh my gosh, YES!! It's like you're speaking my mind, Nea -- I feel the exact same way!! I gave it a shot, didn't expect much, but ended up absolutely LOVING it (and Zachary! <3)! The whole world and characters and story are all just so awesome, and I can't wait until this one comes out either! AMAZING pick for your WOW, Nea! :) And don't you just love those new covers? GORGEOUS!